Before starting out to the South Island’s East Coast, we back-track to Nelson from our outing at Nelson Lakes in order to rent a house. Why rent a house, you ask? Several reasons, really. One, Ginger is getting tired of living out of a suitcase – we’ve been doing this since May, mind you. Two, it was always our plan to stay for a number of months in one spot to get the real flavor of NZ. And finally, we’re spending a significant amount of money (twice what we would spend in the US!) for lodging in generally small and unimpressive motel rooms. Renting a furnished house would cut our daily lodging costs more than half, although rentals are for a minimum of 6 months and do not include utilities; still, we think we’ll win the cost battle. 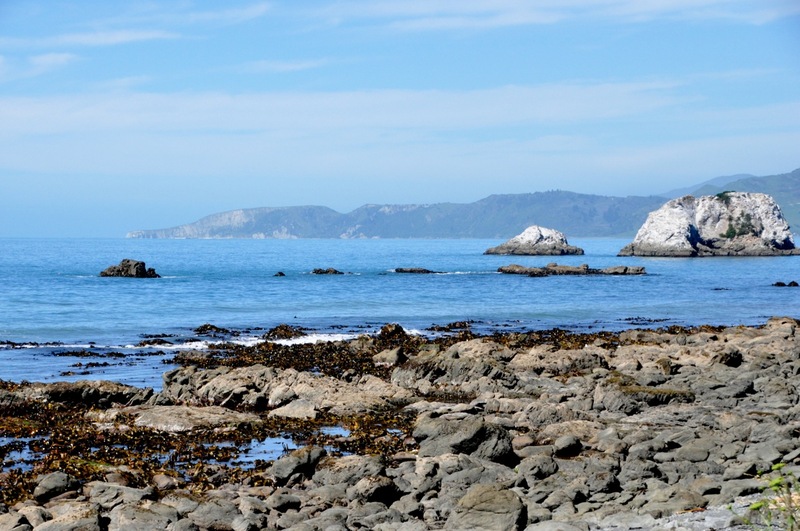 The Nelson area is drop-dead gorgeous, with sun, wineries, beaches, arts, and nearby National Parks. So here we are. 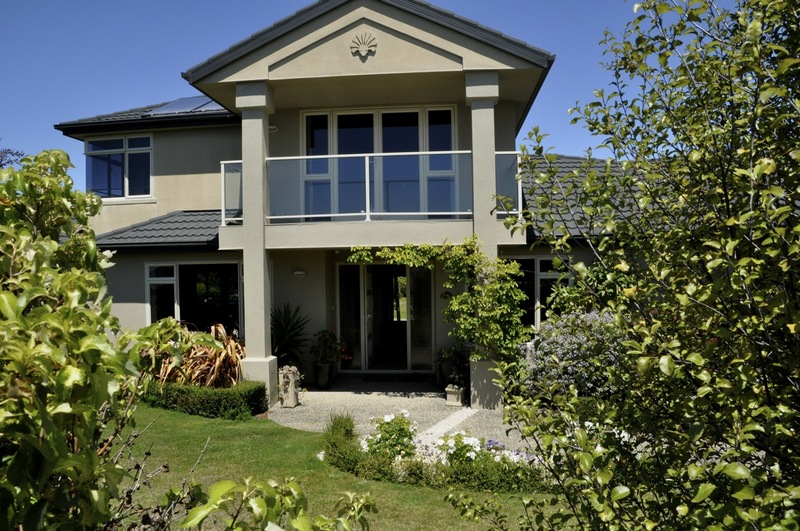 We looked at several places in Nelson itself, our first choice, but ended up in a fantastic house in nearby Ruby Bay. Not bad, eh? It’s on a hill – wait ’til you see the views of the bay! 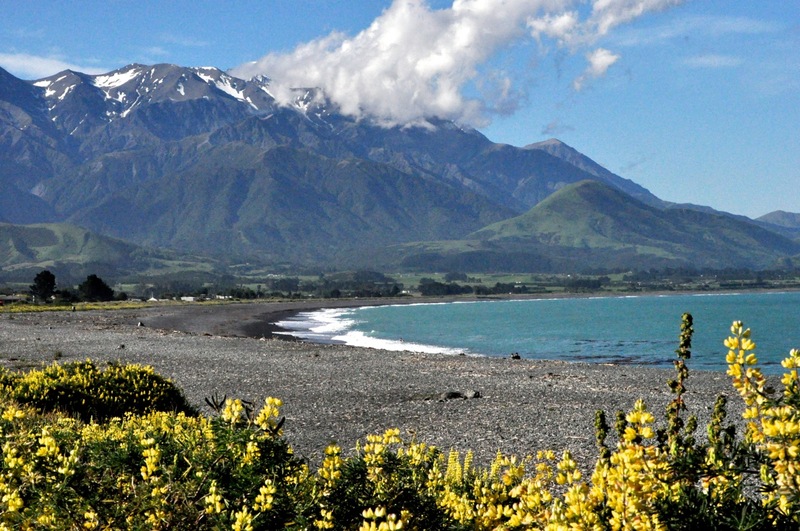 So having rented a house, we immediately leave it to explore the top half of the South Island. I promise Ginger that after the next couple weeks of exploring, we’ll come back to crash – saving the lower half of the South Island for February (the tail end of the busy summer vacations for Kiwis). I’ll show off our new place in a later post when we come back. seems that the high ground has the advantage, and the mouthy challenger thinks better of things. Finding his place on a lower rung, he can only look covetously at the upper crust. The seals are fun to watch. For animals without feet, they move around very well and pretty fast, using their hind flipper to push off; kind of a high-speed undulation. They’re also pretty cute, like the guy on the right. There seem to be two types here, dark black and brown; I don’t know the difference. 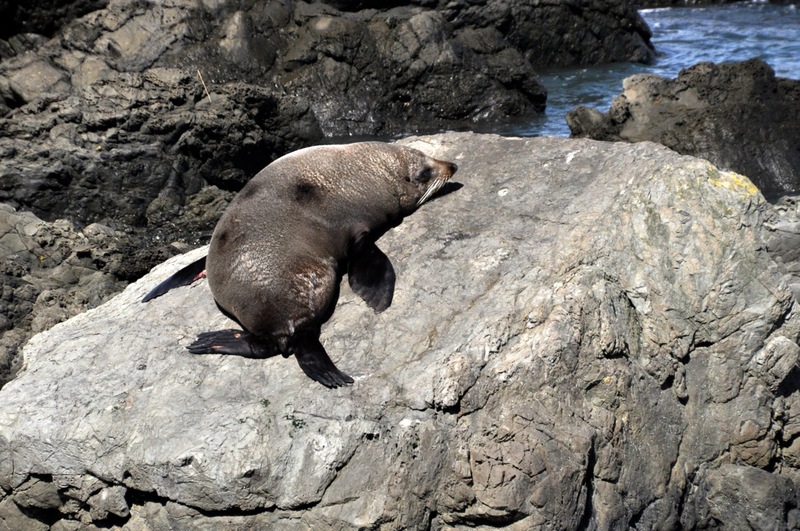 One is certainly a fur seal, of which NZ has a lot. I’ve captured the interesting interactions of these guys, but the primary activity of the seals is the relatively static and unchanging “sittin on the rock of the bay”, working on that tan. Not a bad life, I’d say. backstroke (left image) or synchronized swimming routines (right). 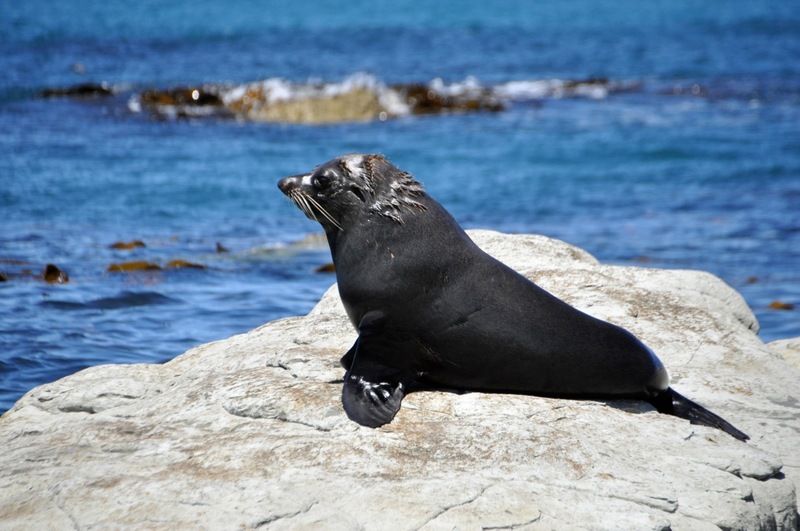 There are other animals of course; birds like the gulls and pied shag, that add color and motion to the relatively static snoozing seal colony. “isn’t it nice?” Yes it is. We’re enchanted, and I take a bunch of pictures. are just chilling, enjoying the scenery and looking picturesque themselves. confrontation, just nose-to-nose “Hi Babe”. I can just imagine her saying “Honey, could you go get me a yummy octopus?” Anyway, in fact off he goes, seemingly on a mission. He climbs out, bounces over the rocks (and you can see how his rear flipper propels him along), and disappears into the deep water, apparently after something. encounter shown above is certainly not the “Hi Babe” greeting, right from the onset. The discussion is animated, the telling arguments made, and resolution followed. How things were decided I don’t have a clue. There was no physical contact, or overt threatening, just some careful circling and one seal says “OK, you win”. No short straw was drawn, no “rock, scissors, paper” decider. It was clear, however, that the winner was “The Dude”. moving quietly and cautiously. Apparently not quietly enough. Brutus raises up, gathers his flippers underneath him, and looks me directly in the eye, quietly, calmly, and ominously. “Come a little closer, idiot”, he seems to be saying. I beat a hasty retreat, and on turning around I see the last picture; Brutus has fallen over, lying on his back and laughing like crazy. Should be a five-yard penalty for taunting, if you ask me. of the tide pools in our Acadia National Park in Maine, which has more colorful anemones and sea cucumbers and the like. Take that, New Zealand! Famous Kaikoura Seafood BBQ”, established a whole 10 years ago, and proudly recommended by (Kiwi humor). For lunch we share a lobster (Kiwis call them “Crayfish”). I must say, lobster for lunch is very nice! bay off in the distance is mostly in cloud, you can see the bustling city of Kaikoura down below, and the other side of the peninsula is seen to be at least as gloriously beautiful as the Kaikoura side, even in the fog (last picture). New Zealand is one gorgeous country. 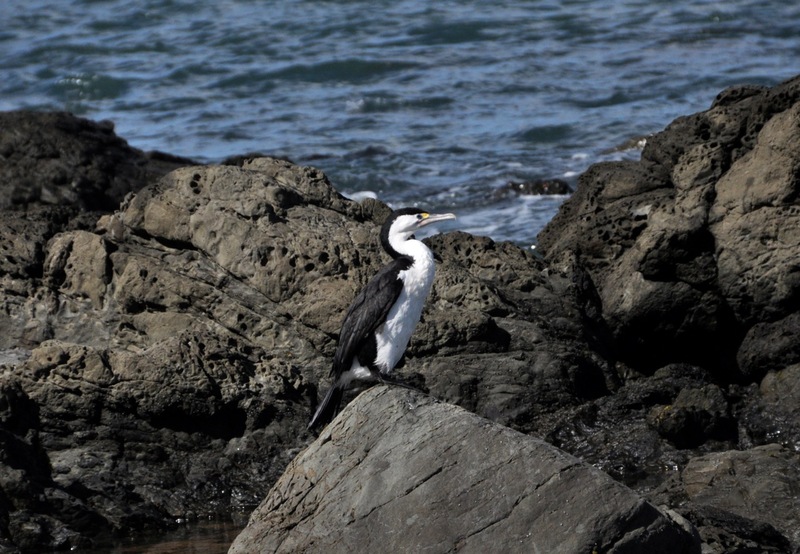 We’ve seen enough seal cavorting, so the next day we explore more coast – which is beautiful as always – and we watch the shags for awhile. They preen a lot, which is not terribly interesting, but the entertainment occurs after they take to the air. I love watching their landing. It is either marked by indecision as to what would be the best spot, or it is just the sheer joy of “skippin’ over the ocean”, like a shag. 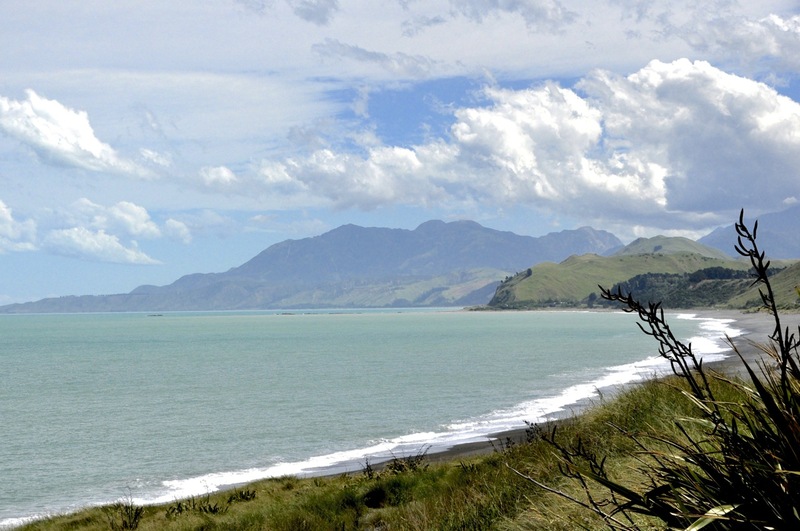 Next post – off to Christchurch! I never realized the NZ was so beautiful! It is breath-taking! Glorious. I’ll bet the sunsets/sunrises are ‘killer’ as well! Reid, you are so right! The sunsets are amazing; evening with few clouds, the blue mountains and pink sky are mesmerizing (ah … sunrises are not what these Warners do, so not sure about them!). And it’s not just the sunsets that are killer. The sea, the mountains and the clouds play games with the light; the world is a kaleidoscope here.